Sombrero imagines Mexico as a Technicolor dream land. Its story of three love affairs is sprinkled throughout with authentic details, from songs and dances to costumes and locations, but this is life south-of-the-border Hollywood style, which is just what you'd expect from a lavish MGM production. Now this enjoyable, if jumbled, romantic melodrama is available on DVD from Warner Archive. Ricardo Montalban stars as Pepe, a mischievous, but good-hearted cheesemaker who is determined to end a feud between two villages, one of them his home. He is equally set on winning the heart of Eufemia (Pier Angeli) the daughter of the mayor in the village opposing his own. 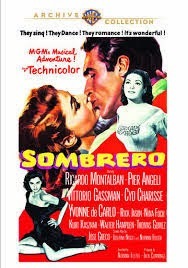 Pepe's friend, the wealthy Alejandro (Vittorio Gassman), is also similarly obsessed with a forbidden love, the poor Maria (Yvonne de Carlo), whom his father feels is not worthy of his son's position. He instead wants his son to marry the more prominent Elena (Nina Foch). In yet another forbidden affair, are Ruben the candy peddler (Rick Jason) and Lola (Cyd Charisse), the gypsy sister of a superstitious and possessive bull fighter (Jose Greco). Everybody in this movie seems to be star-crossed. In the midst of the pining lovers and feuding villagers, there are songs, dances, festivals and an amusing chase sequence. Montalban sings a charming tune; Greco dances a bracing flamenco and Charisse is unusually primal in a passionate solo number. It all feels thrown together, the marvelous, the dull and the baffling. I found I had to rewind a few times to get my bearings with the plot. There are also so many characters suffering in various ways that the melodrama can seem to heave a bit too heavily at times. Still, Sombrero is a fascinating oddity. The Mexican location shooting provides a fascinating glimpse of the country in the 1950s (particularly of Mexico City) and the unusual presentation of the songs and dances makes it feel less like a musical and more like a drama/romance with artistic interludes. I enjoyed the movie for its novelty and oddball, but somehow cohesive cast. Mexican Montalban is supported by an amusingly international group of players. In 1950s Hollywood, an olive complexion, and dark hair and eyes made an actor Latin enough. Among the Italian, American, Canadian, Dutch and Austrian stars, only Foch seems not even "Hollywood Mexican." A must-see for devotees of its stars. An enjoyable excursion for fans of big MGM productions and musicals that go off the beaten path. It's definitely worth it for the stars Laura. The movie wouldn't have much going for it otherwise, but it's an interesting oddity.